It took a while but we’ve finally got this very active road warrior booked at GroundZero! If you haven’t seen his show before you will be surprised by the intensity and passion brought forth by this extremely talented bluesman. 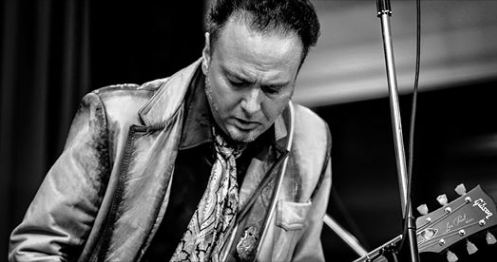 With the release of his fifteenth album 17 Vultures, bluesman David Gogo continues his blues-rock crusade by pushing himself forward, yet again. Not that looking back on his career is a bad thing. He has performed on stage with the likes of BB King, Johnny Winter, Albert Collins, Bo Diddley, and Otis Rush. He has been chosen to open shows for ZZ Top, George Thorogood, The Tragically Hip, Little Feat, Jimmie Vaughan, Robert Cray, Robin Trower, and Wishbone Ash. His songs are featured in films and television and have been covered by a variety of artists, most notably Buddy Guy. It took a while but we've finally got this very active road warrior booked at GroundZero!